Vice President M Venkaiah Naidu asked Members of Parliament not to address the Chair of the Rajya Sabha as "His Excellency", he wants MPs to say "Honourable Chairman" or "Vice President"
Rajya Sabha Chairman M Venkaiah Naidu tells MPs not to address him as "His Excellency"
M Venkaiah Naidu said don't address the Chair as "His Excellency"
As Chairman of the Rajya Sabha, M Venkaiah Naidu has a few firsts against his name. Breaking away from convention, Mr Naidu, told lawmakers not to address the Chair as "His Excellency" and instead say "Honourable Chairman" or "Vice President". 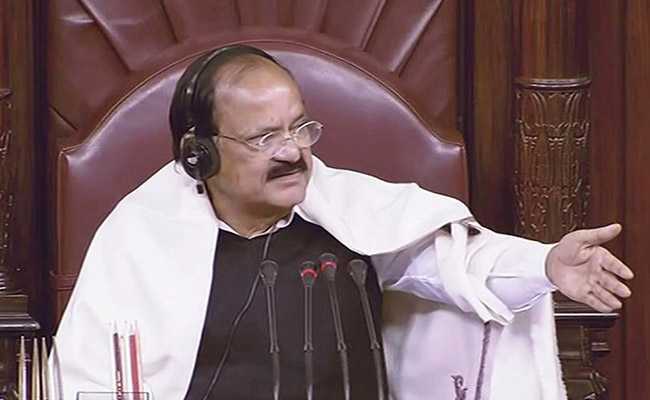 "I often find it embarrassing when the members and even others call the Vice President His Excellency... there is no need to use such phrases in future", said Mr Naidu, whose suggestion came during the Zero Hour when Janata Dal-United member Harvansh Narayan Singh was laying papers in the House. The Vice President is not in favour of colonial lexicon; earlier during the Winter Session, he had asked MPs to stop saying "I beg to..." before laying papers; he said "Just say, I rise to lay the papers or simply, I lay the papers on the table of the House." Normally, ministers, before laying the papers, conventionally used to say, "I beg to lay on the table of the House papers listed under my name". In another first, Mr Naidu told the House on January 2, that "The Rajya Sabha made history... for the first time, all Zero Hour submissions, all Special Mentions were fully completed." He had praised MPs saying, "Your cooperation is good, so my operation was very smooth and that's why the House was able to set this record." Mr Naidu has also once reprimanded MPs for being late or skipping Parliament. "I would like to advise the Parliamentary Affairs Minister to see that Ministers who are supposed to lay papers on the Table of the House are in the House on time," Mr Naidu had said, adding if some Ministers have other engagements, they should not list papers against their names.